Jul. 27th, 2018 @ 06:59 pm Even more foodtrucks! So what do you do after working hard on the house for eight days straight, and the weather is very good? 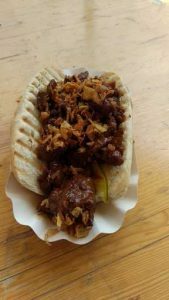 Well, you find a nearby foodtruck festival and go there! As usual, we did a tour of all the offerings before we dug in. Instead of paying at the trucks themselves like we did with previous festivals, we had to buy ‘coins’ at a central spot. These coins turned out to be plastic chits that came stuck together in ‘mats’. You could also break them in half, because some of the things on offer cost 2,5 coins etcetera. Those coins didn’t seem to be re-used, which irked me. Drinks were served in plastic Coca Cola cups that proudly proclaimed that they were made with 40% recycled material — that weren’t re-used either. I really didn’t like that aspect of the festival. 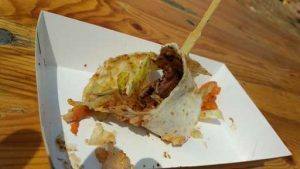 Our first food was ‘Korean soul food’: a Beef Bolgogi wrap. We selected ‘medium spicy’, which was right for us. I enjoyed the slightly sweet marinaded beef and the slightly sour and spicy taste of the home-made kimchi. 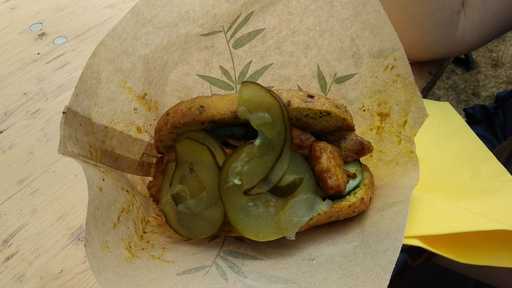 Second course was an Indonesian chicken satay sandwich. There was not much sauce to go with it, which was fine: often this is just a greasy blob anyway, so we didn’t miss it. We added some ketjap sambal and fried onions. The meat was so, so soft! Delicious. 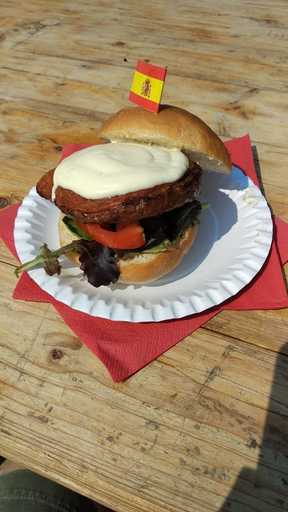 A Spanish burger. The patty was freshly grilled on a large charcoal grill, with some chorizo on top. The sauce was made with orange, which made for an interesting combination. We had to wait for that burger in the full sun, so we were getting a tad warm. 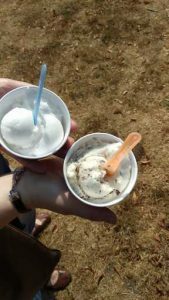 We decided to get some ice cream (lemon sherbert for klik, straciatella cream for me) to enjoy on a park bench under the linden in the park. Chicken massala in a bun made of spiced dough, from the Surinam kitchen. We topped it off with some cucumber pickles. Again, the meat was so soft and tender it almost melted in your mouth. The spices in the bread really added another layer of flavour. A “chimney cake”. 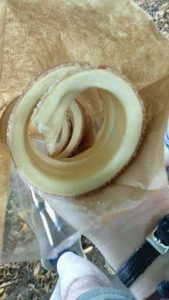 I had never heard of it, and thought it would be like baumkuchen. Here’s ours being baked. We had it dipped in cinnamon sugar — apparently the most popular choice. The roasted dough is crunchy on the outside, but really soft on the inside. And since it’s been turned around the ‘chimney pipe’ (or in this case, a wooden stick), it spirals around, which makes it easy to eat. But it was a lot, and it was good we shared! After that, we got a last drink before returning home, our coins gone and our bellies full. It’s a shame that plastic is still so widely used. I went shopping the other day and so much is still used. It's weird that we use plastic, a material that's been engineered to last a long time, mostly for disposable packaging. It makes no sense. Exactly. Not nearly enough is being done to remedy it. 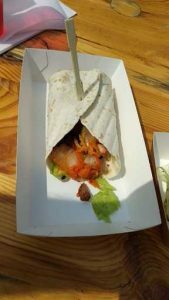 Mmm, I love Korean-fusion tacos, burritos, and wraps! I've never seen or heard of a chimney cake, either, but that looks fun to eat! It strikes me as like a cross between spiral potatoes and deep-fried anything (like elephant ears or churros), both of which are standard fair food where I live. 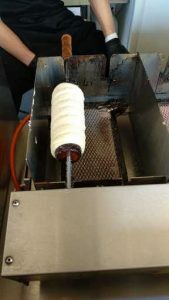 Apparently chimney cake is an Eastern European invention. It's not fried, it's literally roasted over a fire! The dough is like a light, sweet bread dough. 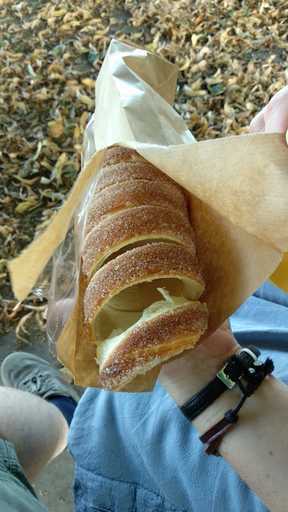 But with that cinnamon sugar to go with it, it certainly sits in the same niche as churros. Other events that we went to weren't as bad. You'd buy a hard plastic glass with your first drink, and that would get re-used every time you got a drink. (You'd hand in your used glass and get a clean one back.) The glasses are sturdy enough to be cleaned and re-used. We re-used our glasses from last year without a problem. And you'd pay with card at the foodtrucks themselves, which means no waste with these weird plastic coins, and it would never occur that you wouldn't have enough coins, or coins left at the end. The trucks themselves serve the food on paper plates. Yes, that's not re-usable (as plates), but at least it can be recycled or composted, so that could have been a lot worse. Ah, that makes sense why it's got "chimney" in the name, then! The drinking glass system sounds like a good one! And yes, paper at least is better than plastic. Yeah, this was just at the start of the heatwave, so it wasn't that bad. But I don't think I'd want to do that this weekend... We've been eating a lot of salads too!